So a few weeks ago Kat posted about how I fulfilled her dreams by making this slate chalkboard for our dining room. Check out this beast! It all started about a year ago. 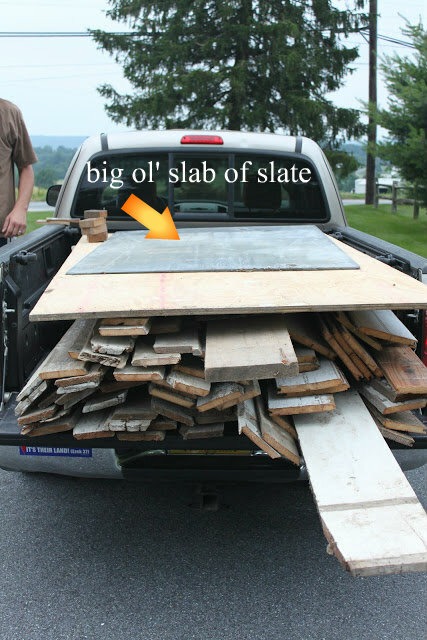 We had been frequently checking Craigslist for barn wood or more specifically free barn wood. I don't know if you have ever looked into buying used barn wood. It is not cheap but there is a lot available in our area. Well one day someone on Facebook told Kat about a listing for a free barn. All you had to do was dismantle what you wanted and it was yours. I called the guy right away and ran over that night with two of my friends. It had already been picked through, but we spent a few hours tearing off everything else that was easily salvageable. After the truck was full, I decided to check in some of the smaller rooms downstairs and there leaning up against the wall were 2 huge pieces of slate. The one was slightly broken but the other was perfect. Now several years ago, I would have been like, "Look at the huge black hard thingy. It's free and nobody wants it, let's smash it." But instead I was like, "Look at that huge piece of slate. My wife will love it and me forever." And I was right. So on the truck it went. 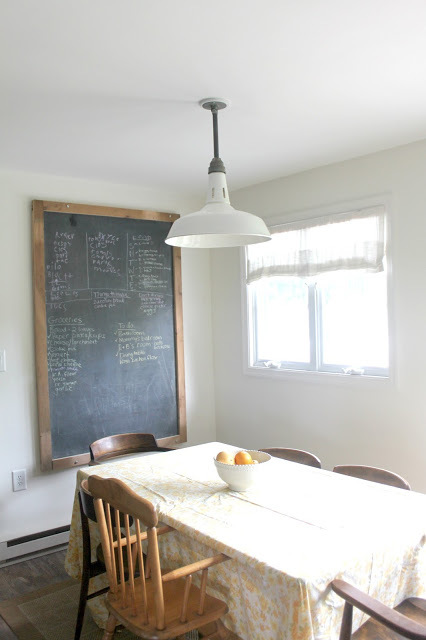 I knew that she had been talking for years about how she wanted a real slate chalkboard and had even regretfully passed up a much smaller one at a thrift store a few years earlier for like $75. Well this one was free and of course huge. I seriously think it weighs 150 pounds. I knew that I had to somehow make this work. It sat in our basement for about a year until a month ago when I finally got the time and guts to tackle it. I thought it would be cool to make the frame out of barn wood and we happened to have this old barn door in our basement. It was kind of rotten on the bottom and I knew we would never use it. I carefully dismantled all the boards and gave them a good sanding. I then propped them up against our cluttered laundry area and Flyer dryer. My idea was to rip the boards down to about 4 inches with a table saw and then notch out a one inch space for the slate to lay in. I then notched back another 1/2 inch so I could put some kind of board behind it and screw into these frame boards holding the slate in place. This sounded great but as I went to put the slate in place I realized that this thing was an absolute monster. I could barely move it myself and I was pretty worried as to how I was gonna hang it. I doubted that this notched frame would be strong enough to hold it. So anyway, I decided I better rip the frame boards down to about 2 and a half inches wide and notch them back an inch and the depth of the slate which like 5/8''. Luckily, I still had some boards left over from the first time i ripped the barn wood with the table saw that were exactly 2 and a half inches. I hope you are able to follow all this because honestly I really wasn't sure how all this would work when I was doing it. I just went with it and hoped it turned out. As you can see above, my top priority is always safety first, wearing the appropriate shoe wear for the job. Seriously, these flip flops were so old and uncomfortable but I was too cheap to buy new ones. (Actually I finally did before we went to the beach a few weeks ago to avoid embarrassment. Check these out!) Anyway, I cut the notched boards to length and laid the massive slab of slate in the notches of the boards on the floor. This was no easy task as, like I said, it was huge and clumsy and the boards kept moving and I was doing it by myself and I even had to deal with a large chunk of the corner breaking. I thought all my work was for naught and that I was going to have get this thing cut smaller to avoid the break. I was set back but then figured I might as well just try gluing it with this. I had some left over from another large broken stone experience. The slab actually glued back together very well and to this day you can barely tell it was broken. Now that the slate was fixed and correctly laying in the notched frame boards. I took the other boards that were not notched and cut them longer on the top and bottom so that the they would screw into the notched side boards for strength. I then cut the shorter side boards and ran screws like every 6 inches. Above you can see me adding a few extra screws to make it tight. You may also notice that in a lot of these projects we do, my dad's head often makes an appearance at installation time. As you can see he is more than happy to help. You may notice a few things in the above picture. First, yes, I really was making my wife’s dreams come true. Second, it was hot that day, this was my pre-beach tan, and no, I was not working naked. This picture actually reminds me of my college days. I went to a very conservative Christian college in Florida. Go Eagles! (doesn't almost every Christian school use the Eagles as their mascot?) Anyway, the school had a large library where I would sometimes go to look at sports magazines or read the USA Today. Well the first time I was looking through one of the magazines, I saw a picture of several people lying on a beach. I was looking closely at it and I was like, "Why are all these women wearing black dresses?" It took me a few seconds but I soon realized that someone skillfully used a magic marker to make the picture G-rated rather than PG-13. I then noticed it many other places. Whoever they hired to be the image desexyfier was quite skilled. In honor of that man, here is my attempt to keep this blog G rated. Hat added for more conservatism. Back to the chalkboard. Finally, I was ready to secure this thing to the wall. I was still nervous not knowing if this frame was going to hold or how to bolt it to the wall. I bought four 5'' lag bolts. My dad suggested that we bolt the bottom and the top. We had to find all the studs, do a lot of measuring, pre-drill the holes and then bolt it to the wall. All this while my dad is holding it against the wall supported on a chair. Our first attempt was slightly unlevel which I knew would never fly. I took out all but one bolt and made a few adjustments. This is how it turned out. It is now a large (aprox. 5.5 feet by 4 feet) focal piece for our dining room that can be seen from several other rooms in the house. Now on to the next dream fulfillment! Fully clothed this time (maybe). I love it! Passed up some large slate years ago from a school, and have regretted it ever since, so good find!! Do you have that special print or picture that needs a special frame? Then you need to frame it with a rustic, recycled wood frame. The recycled wood has such great, rustic characters, and adds beauty to your print or picture. Read how to Work With Recycled Wood. Everybody knows how to use reclaimed wood flooring, right? Just get it for free and put it down on the floor. Not exactly. Reclaiming is the hard part. Taking apart an old barn or factory or textile mill is difficult, dangerous and expensive.